I'm not convinced that things are better now, but I thought, I don't really care; I'd like to just play for fun. But I'm a little stuck, how to get back in, I don't even really know the rules anymore... So to start with, list-building... What lists are people running and why? I have 15,000 points of orks so I can field anything... And if I can't field it, I can build it... What are people running that is moderately successful? Cause We's Da Orks, and You's Not!!! In my opinion, Orks can be very good with lots of units in trucks. Filling out your troops with boys in trucks (with claw nobs), and then a bunch of tankbustas in trucks will do pretty well. Tank bustas are really good. Stick with 1500 points or less and you'll do fine. Things get a little crazy and stupid higher than that it it's difficult for orks to scale up like the other powerhouses out there. Speed freaks, green tide, and kan walls are all still viable armies and I've had success with all. Every unit in the codex has a role and while not everything is optimized, I don't find any unit unsatisfying to play. You may just have to rethink some of them. For example; kommandos seem weaker as you can't assault directly from outflanking anymore, but they can scout and have great center board control, especially in an age of shooting based armies. 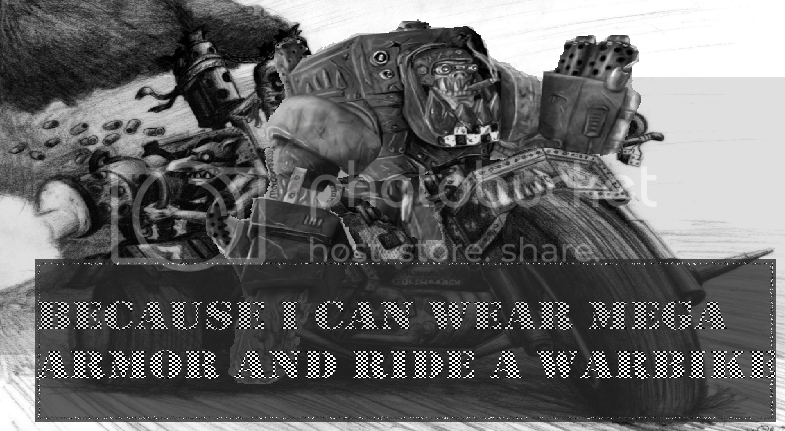 The important thing to remember is to have fun and that Orks never lose. I think orks preform better at higher points levels,also you're going to see nasty stuff no matter the size of the game. The detachment of Formations in the Gazgull book is quite strong, but it can be heavy on points. Once you take the core (whole bunch of boys in trucks). Then, add in the council of Waaagh, which gets you Gazgul (and two more free warlord traits for him), and he's then Waaaghing every turn and has a 2+ inv the whole game. At 1850pts, you can then add in some sort of axillary choice (maybe tank bustas), or drop trucks and upgrades on the ork boys mobs and add in the bully boys. One more thing, is that there is a character from forgeworld, which gets you a highly discounted stompa, great for evening the field. Fill it with mec boys, and they'll repair damage to it every turn. You'll need to run a combined arms detachment for that though. Another bit of advice, what are you guys using for anti-air these days? If you want cheap anti-air, tractor cannons (or whatever they are called) as part of the mek guns are fantastic. It's less then 100pts for 3, They are able to easily immobilise fliers (which gives a 50/50 chance of knocking them out of the sky, and are immensely cheap. They are also great at grounding flying monsters creatures out of the sky too. A BW full of tank bustas is great anti air. with the removal of the glory hog rule tank bustas can now target what you want. So they hit on 6 instead of 5. With 15 of them in the wagon they can still shoot down everything in the game.